Firefighters are on scene of a residential fire. Photo courtesy of Snohomish County Fire District 7. At 9:03 pm on Wednesday, January 16, 2019, firefighters were dispatched to a report of a North Creek house fire at the 20400 block of Little Bear Creek Road with reports of a person possibly still inside the home. 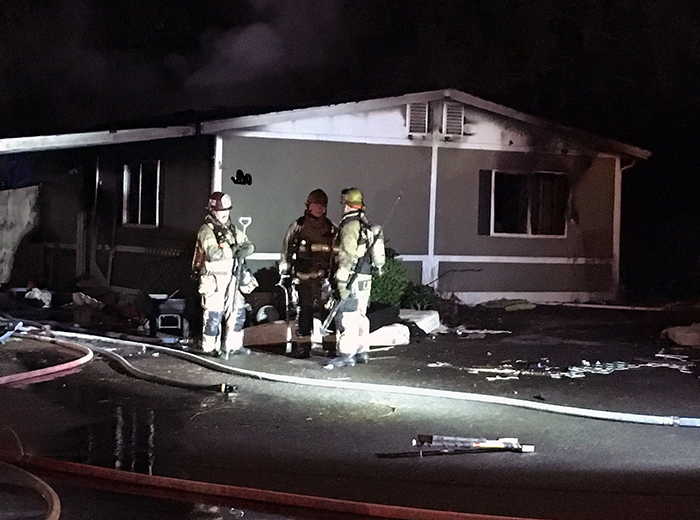 Crews arrived to find a fully involved mobile home with fire exposure to a nearby home. One crew quickly pulled a fire hose to control the fire while an additional crew entered the home to search for the possible victim. Crews did not find anyone in the home. Firefighters quickly gained control of the blaze and protected the nearby home. One firefighter sustained minor injuries. He was treated and released at the scene. Woodinville Fire and Bothell Fire assisted in fighting the fire. The Snohomish County Fire Marshal is investigating the cause of the fire.